My faithful readers love the blog recipes I print here. Recipes can be found just about anywhere – in a book, online, in outer space (just kidding; I’m not up on all the online sites, food networks, etc.!) 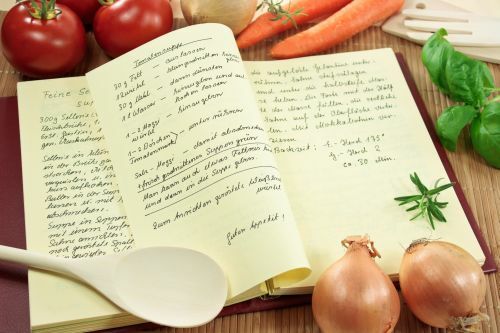 Give me a good, old-fashioned recipe book any day. In fact, I have a nice collection, and use them frequently! One of the best things you can do for your body is to change things up once in a while. This can be your daily routine, your workout, your drive to work or school, and even, the way or what you eat! Change and new things are almost always good for us. One way to do this is to try new foods and food preparation. I advocate incorporating lots of good, wholesome, fresh food into an eating plan, and for the next month, I’m challenging you to try some new recipes! Don’t stay stuck in a rut where you have pasta on Monday, chicken on Tuesday, fish on Wednesday, etc. etc. Try some new things! Pick a starting week, and give yourself a segment of time – a month, 6 weeks, etc. – where you pledge to try a new recipe once a week. If you like it, keep it and make it occasionally. If you don’t, toss it! Try some new foods, or prepare foods you like in different ways. Make a restaurant meal you love for yourself at home, or make a processed meal you like from scratch. Buy a new cookbook and make several recipes you find there. Experiment! I challenge you to consider this idea for the month of March. March can be blustery – think of a new soup, or warmer – break out a new grill recipe! Your body will love it, and you may find it’s easier to make new foods than you thought. If you make a recipe you love, email it to me! Maybe you’ll see it in print right here in this blog!